Hey guys, time for another quick - but big - update. There's no denying that the server is having a pretty hard time. New players won't stay, old players leave. We've been dealing with a reducing player count for a while now, and it's time for it to change. In this post I'll briefly explain what I'm working on right now and how it's going to change the server. It's quite a lot of text, but make sure to read everything in the post. - Survival and SkyBlock worlds will reset; Survival will keep custom biomes and get a custom end world. - New plugins will be added, others will be updated. - Survival will get new custom items and tiered monsters. - Minigames will come back soon. - The server store has been automated; IBAN payment info updated. - We no longer support cracked Minecraft, only premium players can join. - Update date still unknown; Possibly at the end of September, maybe October. You might have read the previous new post and/or seen the red bar at the bottom of the site a while ago, but NLGameVideosNL is going to get a name change. I (still) don't know what the new name is going to be, but I do know that it's going to be a more Minecraft related and easier to write/remember one. If you have suggestions, feel free to let me know. 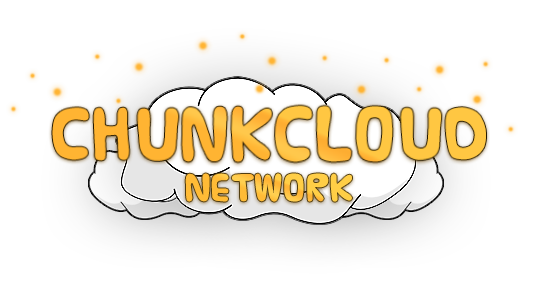 The new network will be named: ChunkCloud. If you want to know the exact reason behind my decision to change the name, read the previous news post. As usual with our big server updates, we reset the worlds and everything that has to do with the world. This won't be any different this update. Don't worry, the awesome custom biomes in Survival will also be present in the new world. Besides just resetting the maps, we replaced both the Survival and SkyBlock spawns with new, way nicer spawns and will fit our 'theme' more than the current ones. For Survival, the end world (/warp end) will also change quite a bit. It will now also have a 'custom' feeling and no longer looks like the regular vanilla end. In the next few days, I will post a few 'sneak peaks' of the spawns, so stay tuned! We will add a few new plugins to make Survival and SkyBlock even better. Along with the new plugins, we will also change/re-configure certain plugins to make them fit our server needs better. To make Survival+ even better, we've added a few new custom items to the server named 'souls'. Souls can be obtained by killing monsters. Monsters will soon have tiers. The higher the tier, the stronger the monsters are and the higher the chance of them dropping souls and other loot will be. Higher tier monsters will also give you more EXP once slain. The tiers will rank from 1 to 6, where the tiers 4 - 6 can only be spawned in a special way: By dropping cursed souls on the ground. To obtain cursed souls, the 'witch' has to curse a bunch of your obtained souls and melt them into 1 cursed soul. Once dropped, lightning will strike the ground and summon tier 4 to 6 mobs - your worst nightmare. As requested by many, minigames will return to the server! I can't really tell you anything more than this, since I don't know which minigames I will add to the server yet. The only thing I know is that it will be like 2 or 3 minigames and that you might win prizes which can be redeemed in the Survival and SkyBlock server. I can't guarantee that the minigames will be added with this update, but they will come back soon. The minigames /server icon has been re-added already! Ever since the last update, the old VIP and Donator ranks were no longer supported in Survival and made place for the current premium ranks. Players who bought an old premium rank before the update would still have it now, but it was no longer possible to buy one. SkyBlock still has no new premium ranks yet, but it will after the update. This means that the old VIP and Donator ranks will also be no longer supported in SkyBlock. Since all playable servers will have new premium ranks, I've decided that it's time to say goodbye to the old VIP and Donator ranks. With this I mean that from the 1st of November this year after the update, the old premium ranks will be permanently removed from the servers, even from players who have bought one before. Because we know that some of you spent your hard earned money on an old premium rank, we give players VIPs or Donators the oppertunity to buy one of the new premium ranks with a decent discount. If you are one of the players who bought a VIP or Donator rank and wants to upgrade to a new premium ranks with a discount, please contact our support desk. If you are one of the players who once bought something from our server store, you know that you have to wait until one of the staff members gave you your bought product(s). Since we use our own developed webshop instead of the popular system BuyCraft, payments won't be processed automatically after the payment. Well, after the update, this is no longer the case. I've partially recoded the server store and finally implemented a system which automatically processes PayPal payments. After you completed the PayPal checkout, you will receive your items within 15 minutes. Awesome righ?! Besides automating the PayPal payments, I've also improved the IBAN payment information page and made clear which countries can use the IBAN payment gateway. It was a hard decision to make, but as a team we've decided that it's time for us to stop supporting the cracked Minecraft community. Over the past several years, we've experienced a lot of problems, simply from the fact that our servers are cracked and not premium. We had to add an authentication plugin (/register and /login), which almost every player hated. We had to add an anti-bot plugin, which protects our servers from the countless proxy spam bot attacts we've had to deal with. We had to fix numerous loopholes around the Bungeecord connection process. We've been hacked twice because of such problems. We had to install plugins to fix the no longer working player skins problem, taking up a part of our server RAM and limiting our allowed connections to the Mojang API. We had to deal with plugins which use Mojang's UUID system, even though cracked servers don't use UUID. ... and the list goes on and on and on. Since we are trying to improve our servers and be on a more professional level, we can no longer support cracked Minecraft. We are genuinely sorry for the cracked players who can't afford a premium Minecraft account and who want to play on our server, but won't be able to. If you are a cracked player who played on our network before, the team and I want to thank you for spending your time with us and we hope to see you again in the future! I don't really know what more to say about us no longer supporting cracked, I just hope that you understand why we made this decision. As there's still so much work to be done before the update is ready to go live, I can't really give an exact date and time on when we are going to update the server. I'm trying to finish everything before the end of September, but it might also be the end of October, I just don't know. Once I'm close to finishing the preparations, I'll update this post with a date and time. The update will be performed during the weekend of 18-19 November! That's pretty much it for now guys, I briefly described some of the changes that will happen soon. Join our Discord group or follow us on Twitter to stay up to date with the latest news. Thanks for reading guys, have a great day! What a nice updates but why make the server premium? and also you should add levels to the survival world,and u can get/craft a custom items based on ur level or maybe in order to use this certain custom enchant you need like level 5 or 10? just a small fun idea,and maybe add a pvp world to the survival world? and also since youre removing the old VIPs rank i cant get a new one since my friend bought it for me oh well. Well it's that time again. Taking a lot of screenshots and being a little sad to see my builds go (especialy when I just finished a project) :'c. As a cracked player who also bought VIP and will not be playing Minecraft likely ever again after this, I can only say so long, farewell, auf Wiedersehen, goodbye! I mentioned why we're going premium, it's just too much of a hassle to continue to support cracked. The nether and end will have PVP enabled in Survival, so you can fight with players there. I'm sorry you won't be able to join anymore after the update, hope to see you again in the future as a premium player! Thanks ;) Sorry you won't be able to play anymore. The dicision about going premium has been made months ago. The whole upcoming update has been prepared with premium in mind. I agree with blancch on the whole "long wait until reset". There is no reason for me to come online until it's here. The only thing I do is check forums for the reset date, but there is none :c. My advice is to give the announcement of a reset when you are like 1-2 weeks away from the actual launch and you already finished the preperations. Those 1-2 weeks are enough time to notify all players and give them time to take screenshots etc. So we only stop playing for a week and get more motivation to start fresh instead of being non active for a month and just forget about the server. @KayThxByee There are barely any players playing on the server anyways, so it doesn't really matter this time. Server resets are simply part of Minecraft Multiplayer. If you want to work on big project and not lose any of them, you shouldn't work on them on a public server. There are way bigger servers out there who reset way more often. 7 months is quite a long time if you ask me. I also was planning on updating the network at the end of September, but due to unexpected school projects, I simply don't have much time to work on the server. @poepjejan1 Well yeah sorry for trying to build something else then a wooden cabin and make decent builds that contribute to making a nice server. I know the resets are part of online multiplayer and I don't have a problem with that. I'm just saying that it demotivates players (read it in server chat AND discord chat multiple times). But hey it's your server. Of course there are barely any players playing; the reset was originally planned around now. And according to the server chat, forum and discord, people were just waiting for it. Thinking "it doesn't really matter anymore" really tests people's patience and possibly kills what was left of the playerbase. I completely understand you are busy with school but just posting a small update on this matter takes no more than a minute imo.